I know it seems that we have a new WhatsApp post every couple of days on Android Police lately, but it ain't our fault. The app's developers, specifically the Android team, appear to be drinking the good kind of kool-aid and kicking one new version after the other with not only bug fixes, but also lots of new goodies. 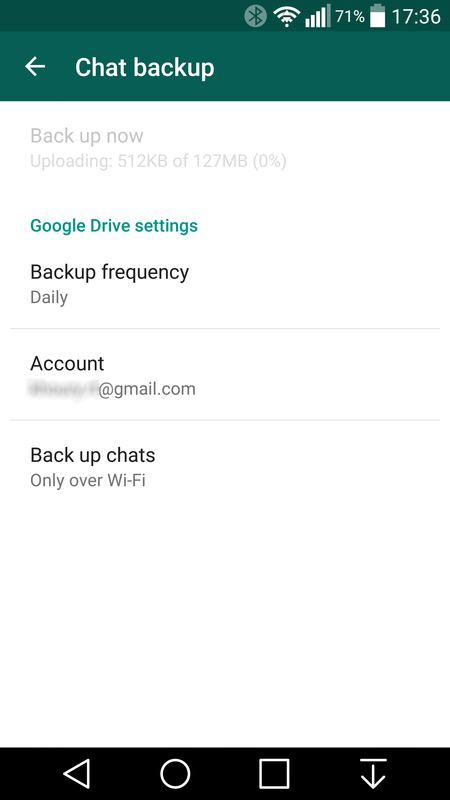 So first there was the Web "client", then the saga of the voice calling feature rollout, followed by the Material design update, and now Google Drive is being implemented as a backup option inside the app. It was only a few weeks ago that we received translation strings that hinted at WhatsApp's potential plan to enable backing up and restoring your conversation history and media to Google Drive. But the function just went live in the app's most recent version 2.12.45 which can be found on APK Mirror — the official WhatsApp Android download page still lists 2.12.44 at the time the article is being written. Once you install the update, head into the app's Settings, Chat settings, Chat Backup, and you'll see a new screen that shows your last backup time and a list of greyed out Google Drive settings. 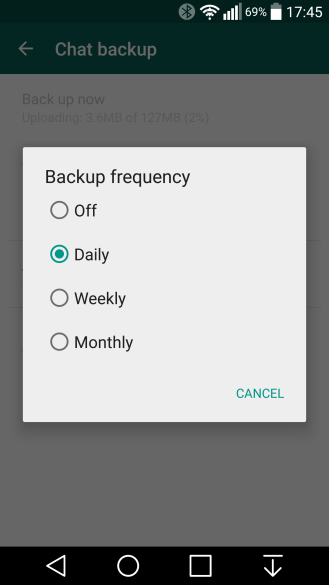 Change the frequency from off to daily (or weekly or monthly), and you'll be able to pick up a Google account for the backup as well as choose whether you want it to use Wi-Fi only or Wi-Fi and cellular networks. You'll then have to wait for 4:00 am when WhatsApp usually does its daily backup for the magic to happen. 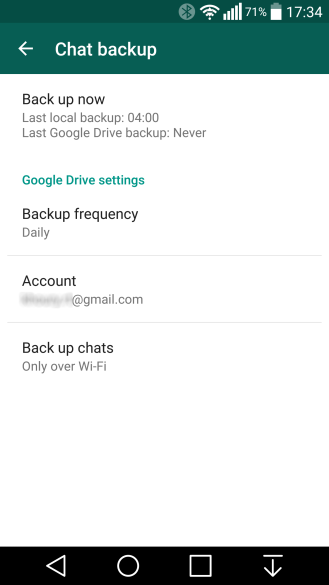 If you're impatient, you can initiate it by tapping the top Back up now option, which first does a local backup then starts sending the data to Google Drive. However, you should be aware that there's no stopping the backup once it starts and the size is quite large if you have received and sent a lot of media through the app. Even though I had the app set to only use Wi-Fi, I tried turning Wi-Fi off, but the backup had already initiated and it kept chugging along using my data connection. I'm not sure if it's a bug only on my phone or if it's a widespread one, so proceed with caution. For now, my personal backup hasn't finished uploading so I don't know what data is exactly sent during the process. Comparing the size of the backup to my local WhatsApp folders, I'm certain it doesn't just contain the conversation history and I'm pretty confident that all images are included but videos aren't (just like the translation strings hinted at). I'm also not sure if the data will be visible inside Google Drive or kept hidden and only accessible when the app initiates a restore. We'll update the post when we have more information. Backups are incremental, which means that WhatsApp will upload everything once, then only the changes daily/weekly/monthly. Backed up data is hidden inside Google Drive. 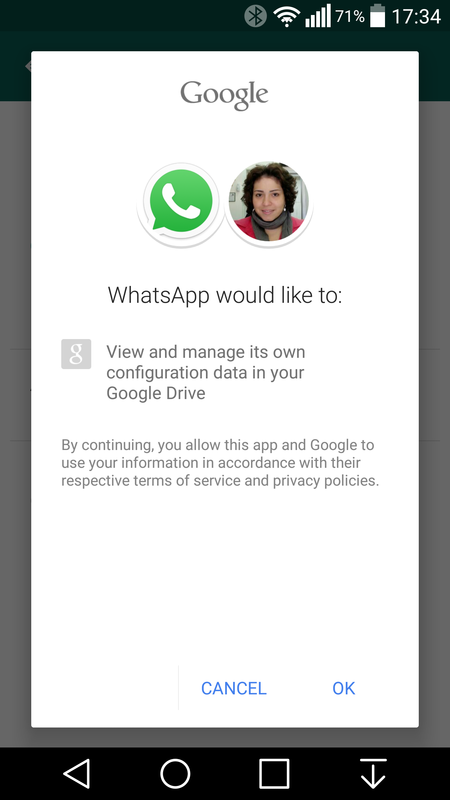 Open your Drive on the web, go to Settings, Manage Apps and you'll see WhatsApp listed as having hidden data. Videos aren't backed up, only conversations and photos. When you install WhatsApp again (on a new or the same phone), after you log in with your phone number, the app will check to see if there's a Google Drive backup (it will still check for local backups too) associated with your account and offer you one shot to restore your entire data from the cloud. Alternate title: WhatsApp 2.12.45 Adds Google Dri... WAIT! I'm Actually Hitting "Publish" Before Our Inbox Is Flooded With Tips?! Oh, It's A Saturday... Damn, I Thought I Was Getting Better.